Keep those pesky squirrels at bay! Encourage birds into your garden. Protect the feed from squirrels. Use on its own or as part of a feed station. Every bird is different in their preferences for the type of food that they eat and how they eat it. Some birds eat on the ground while others feed in the trees, some are happy to come out to the open to feed, while others prefer the safety of cover. One of the main robbers of feed is the squirrel, infuriating and confounding many gardeners! Now you can protect your precious bird food from those pesky squirrels and let you feathered friends enjoy their meal! 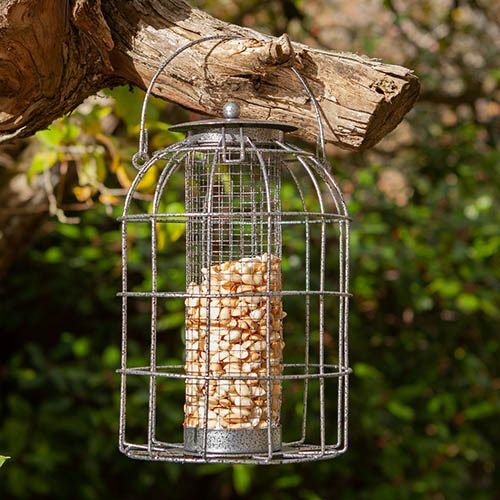 Each squirrel-proof feeder is surrounded by a cage to protect the feed from squirrels and other unwanted garden pests. An ideal feeder to go with our feeding station or as an individual feeder around the garden, it's strong and robust in its construction and holds a good quantity of feed to keep birds happy through the winter. Simple to use, the feeder features an opening lid for a quick and easy way to refill it. Supplied as a single peanut feeder, without nuts, ready for you to fill. Check feeders daily and top up where necessary. Spacing feeders reduces competition between birds and allows more of them to feed at any one time. If you scatter feed on the floor, change the area every few days, and never put out more than is eaten the same day, to discourage vermin. Never put peanuts or suet balls out in nylon mesh bags as these can trap birds' feet and cause injury.